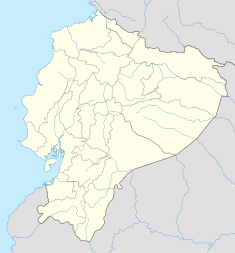 The Lago Agrio oil field is an oil-rich area near the city of Nueva Loja in the province of Sucumbíos, Ecuador. It is located in the Western Oriente Basin. The site's hydrocarbon-bearing formations are the Cretaceous Napo and Hollin formations. Oil was discovered in the area in 1960s. The Lago Agrio field is known internationally for the serious ecological problems that oil development has created there, including water pollution, soil contamination, deforestation and cultural upheaval. In 1993, local residents started a class action lawsuit to force former well operator Texaco (acquired by Chevron Corporation in 2001) to clean up the area and provide for the care of the 30.000 inhabitants affected by oil contamination. In February 2011, an Ecuadorian court ordered Chevron to pay $8 billion in compensation. The verdict was later confirmed by the Ecuador Supreme Court in 2013, with the amount fixed to $9.5 billion. Despite having previously insisted to move the process from the New York Court to Ecuadorian tribunals and having accepted jurisdiction there, Chevron Corporation has refused to pay the judgement claiming that the decision was “illegitimate and inapplicable”. In March 2014, a United States court found that the 2011 Ecuadorian verdict was obtained by the plaintiffs against Chevron through "coercion, bribery, money laundering and other misconduct. In August 2016, an appeals court upheld the 2014 racketeering verdict against the Chevron adversaries. In 2018 the Permanent Court of Arbitration in The Hague ruled in favor of Chevron and said the 2013 Ecuador Supreme Court case was obtained "through fraud, bribery and corruption." In 1964, Texaco Petroleum Company (TexPet) began exploring for oil in northeast Ecuador, in an area which was inhabited by indigenous people. The following year, it started operating a consortium owned equally by itself and Gulf Oil to develop a tract in the area. Nueva Loja was founded as a base camp of Texaco. The consortium struck oil in 1967 and began full-scale production in 1972. The Ecuadorian government, through its national oil company CEPE, now Petroecuador, obtained a 25 percent interest in the consortium in 1974. Gulf subsequently sold its interest to CEPE. By 1976, the consortium was majority-owned by the Ecuadorian government. TexPet, however, was still the company responsible for drilling technical operations. TexPet transferred management of the consortium to Petroecuador in 1990. TexPet's concession expired in 1992, leaving Petroecuador as the sole owner. Petroecuador continues drilling in the area. Over a period of 20 years, the Lago Agrio field produced 1.7 billion barrels (270×10^6 m3) of oil, with a profit of $25 billion. According to Chevron, 95 percent of the profit from the consortium went to the government. This figure has been harshly contested by the government itself. Produced oil is transported by the 498-kilometre (309 mi) Sistema de Oleoducto Transecuatoriano (SOTE) and 506-kilometre (314 mi) Oleoducto de Crudos Pesados (OCP) pipelines to the marine terminal at Balao. Lago Agrio is also connected by the San Miguel–Lago Agrio pipeline. The multiproduct Poliducto pipeline runs from Lago Agrio to Quito. An estimated 18 billion gallons of produced water has been diverted into some 880 unlined open pits, causing severe contamination of streams and rivers relied on by local inhabitants for their drinking water, bathing and fishing. 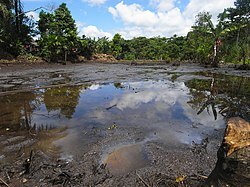 Moreover, 650,000 barrels of crude oil have been spilled directly in the jungles and pathways. The produced water contained polycyclic aromatic hydrocarbons at levels many times higher than permitted in the US, where produced water was typically re-injected underground since at least the 1970's. Given the magnitude of the contamination and its lasting impact many environmentalists claim it is the worst oil-related disaster in the world, the amount of crude and toxic waste dumped by Texaco allegedly being 30 times the one spilled in the Exxon Valdez oil spill. In 1995, amid litigation, Texaco — which would later be acquired by Chevron — signed an agreement with the Ecuadorian government to clean a number of waste pits in proportion to its interest in the consortium, at a cost of $40 million. Evidence has been found that the cleanup was incomplete, as the largest part of the area was not restored and the pits Texaco supposedly cleaned up were simply filled with ground on top to hide the toxic wastes. The plaintiffs in the subsequent litigation maintain that the pollution has resulted in an increase in cancer rates. Apart from maintaining its lack of responsibility for the bulk of the pollution, Chevron has maintained that there is no causal link between the produced water and cancer. A new health study published in 2017 seems however to confirm such correlation. Lawyers for the indigenous residents of the Lago Agrio field sued Texaco in New York in 1993. The 30,000 member class-action lawsuit accused TexPet of discharging produced water into open pits, contaminating the water that was used by the locals for fishing, bathing, and drinking. The case was dismissed for improper venue in 2001. Chevron claims that the company is being unfairly targeted as a deep pocket. It maintains that responsibility for damage and cleanup now lies with Petroecuador and the government, and contends that much of the present damage comes from Petroecuador's activities since 1990, including spills from a pipeline system built by the consortium that Petroecuador has not maintained. Blocked from suing Texaco in US courts, in 2003 the plaintiffs filed their case in Ecuador. In 2008, a court-appointed expert issued a report accusing Texaco employees of not only widespread pollution, but deforestation and cultural destruction as well. The report estimated the damages by TexPet between $8 billion and $16 billion, which the expert later increased by $11 billion. A U.S. district court later ruled in support of Chevron's allegations that the report had been ghostwritten by Mr. Donziger and his associates and an environmental consulting firm hired by the plaintiffs in addition to participating in the bribing of the deciding judge. Cristóbal Bonifaz, the lawyer who had filed the initial action in New York in 1993, was dismissed from the litigation in 2006. He went on to file a case against Chevron in 2007 on behalf of new clients who claimed that pollution had given them cancer. The court found that three of the plaintiffs did not have cancer. After dismissing their claims (leaving two claims active), the court imposed a $45,000 fine against Bonifaz for making frivolous claims. Attorney Pablo Fajardo, who represents the plaintiffs, and activist Luis Yanza received the Goldman Environmental Prize in 2008 for their work in this case. Plaintiffs in the Ecuadorian court case had initially demanded compensation payments of $27 billion. When the court ordered Chevron to pay $18 billion in February 2011 (later reduced to $9.5 billion), the company vowed to appeal, calling the ruling "illegitimate" and "unenforceable in any court that observes the rule of law", and said that "the United States and international tribunals had already taken steps to bar enforcement of the ruling." Plaintiffs were also planning to appeal, seeking damages of $113 billion. More pits existed than previously thought. Since Chevron Corporation has no substantive assets in Ecuador, plaintiffs filed actions to enforce the judgment against Chevron Corporation subsidiaries in Brazil, Argentina and Canada. Already in 2009, Chevron had filed a complaint against Ecuador under the 1997 bilateral investment treaty between the United States and Ecuador, charging that Ecuador had failed to ensure a fair trial and had reneged on a 1998 contract absolving Texaco of any compensation claims. [non-primary source needed][original research?] The three-person tribunal, acting under The Hague's Permanent Court of Arbitration, ruled in 2011 that Ecuador should halt all enforcement efforts of the Ecuadorian judgment against Chevron, both within and without Ecuador. In February 2013, the tribunal said the Ecuador government should have stopped plaintiffs in the case from going to courts in Brazil, Argentina and Canada to try to collect the judgment handed down by an Ecuadorean court in 2011. A spokesperson for the plaintiffs said the "courts hearing enforcement actions would likely pay little attention to the tribunal since it was not binding on the rain-forest communities". Argentina: In June 2013, Argentina's Supreme Court revoked an embargo on the assets and future income of Chevron's Argentina subsidiary. Belgium: In September 2013, The Hague arbitration panel ruled in favor of Chevron, finding that an agreement signed in 1995 by the government of Ecuador released Texaco Corporation from financial responsibility from any claims of "collective damage." However, the panel left open the possibility that Chevron could still be liable for damages incurred by individuals. Chevron acquired outtakes of the 2009 documentary Crude, which covered part of the case. The outtakes suggest that Donzinger considered the Ecuadorian system of justice to be corrupt, and had urged Ecuadorian President Rafael Correa to issue criminal indictments against two Chevron lawyers involved in the settlement negotiations of the late 1990s; the two lawyers were subsequently indicted. When Donziger was ordered to testify about this in the U.S. federal case, he claimed attorney–client privilege but was rebuked by the judge. Donzinger subsequently was forced to hand over all his case files, his computers, his tax returns and bank account information to Chevron, and he was deposed under oath. Donzinger's diary, which had been stored on one of his computers, became a matter of public record. The deposition revealed that the 2009 environmental report signed by a court-appointed expert had largely been written by an environmental consultancy company hired by the plaintiffs. In February 2011, Chevron filed suit in New York against Donziger and several other people involved in the plaintiff's case, invoking the Racketeer Influenced and Corrupt Organizations Act (RICO Act) and alleging extortion and fraud in that they made up evidence and tried to manipulate the legal system of Ecuador. In 2010, the plaintiffs engaged the Washington D.C. law firm of Patton Boggs to oversee the legal strategy of suing Chevron in various countries around the world, to collect the Ecuadorean judgment. Patton Boggs is the leading lobbying firm in the US in terms of revenue,[needs update] and was seen as having the international legal experience needed to enforce the award against Chevron; in return, Patton Boggs was to have received 5% of moneys collected. Chevron sued Patton Boggs, alleging that by participating in the case, the law firm knowingly abetted fraud on the part of the plaintiff's lead attorney, Steven Donziger. In May 2014 Patton Boggs agreed to withdraw from the Lago Agrio case, pay Chevron $15 million in damages, assign to Chevron its percentage of claims collected, and assist Chevron in discovery in Chevron's lawsuits against Donziger and others. In return, Chevron dropped all claims against Patton Boggs. Patton Boggs released a statement that, in view of a US court finding of fraud on the part of Donziger, it regretted its involvement in the case. In March 2014, a United States district court judge ruled that the Ecuadorian plaintiff's lead US attorney, Steven Donziger, had used "corrupt means," including payment of almost US$300,000 in bribes, to obtain the 2011 court verdict in Ecuador. The judge did not rule on the underlying issue of environmental damages. While the US ruling does not affect the decision of the court in Ecuador, it has blocked efforts to collect damages from Chevron in US courts. Donziger and the two Ecuadorian defendants appealed, and on August 8, 2016, the United States Court of Appeals for the Second Circuit affirmed the district court's judgment against them in all respects. Chevron hired former US trade representative Mickey Kantor and former Bill Clinton chief of staff Mack McLarty[when?] to lobby the Obama administration to pressure Ecuador to make a deal via a proposed threat to end trade preferences for Ecuador. The plaintiffs hired human rights activist Kerry Kennedy to conduct public relations for their cause. Kennedy traveled to Ecuador in 2009, after which she blasted Chevron in an article for the Huffington Post, invoking the term "genocide." Kennedy was paid for the effort by the plaintiffs, a fact made public in 2012, but left undisclosed in the Huffington Post or other news coverage of her advocacy. Shortly after her Huffington Post pieces, the plaintiffs lead American lawyer reportedly paid Kennedy $50,000 in February 2010, and the law firm budgeted $10,000 per month for her services, plus $40,000 in expenses in June 2010. Kennedy was also reportedly given a 0.25 percent share of any money collected from Chevron, worth US$40 million if the full amount were to be collected. [better source needed] Kennedy responded that she was "paid a modest fee for the time I spent on the case," but denied that she had any financial interest in the outcome. Ecuador is supported in the dispute with Chevron by a Venezuelan group, The Ecuador Solidarity Committee, and the ex-Minister of Environment of France, Corinne Lepage, and Delphine Batho, a Socialist deputy in France. Neither the plaintiffs nor their legal counsel have the resources to fight a drawn-out legal battle of attrition with Chevron. To finance the litigation, New York lawyer Steven R. Donziger, who acts as a spokesman and lobbyist for the plaintiffs, sold a percentage of the final settlement to a hedge fund. Early on, the plaintiffs obtained funding from the Philadelphia legal firm of Kohn, Swift & Graf, PC. After investing $6 million in the case, Kohn, Swift & Graf withdrew from the case in November 2009, citing differences with lead attorney Donziger. The plaintiffs next turned to Burford Capital, which agreed to finance the litigation in exchange for a share of any award to the plaintiffs. Burford invested US$4 million in the case before it announced in April 2013 that the plaintiffs’ lawyers had misled Burford, and it was quitting the case. -That the evidence placed before the Court is “the most thorough documentary, video, and testimonial proof of fraud ever put before an arbitral tribunal." -That the plaintiffs blackmailed an Ecuadorian judge, triggering him to order the appointment of an “expert” friendly to the plaintiffs. -That Ecuadorian government prosecutors “actively cooperated” with the plaintiffs. -That the plaintiffs bribed the “experts” and ghostwrote their report. ^ White, Howard J.; Scopec, Robert A.; Ramirez, Felix A.; Rodas, Jose A.; Bonilla, Guido (1995). "Reservoir Characterization of the Hollin and Napo Formations, Western Oriente Basin, Ecuador". M62: Petroleum Basins of South America (PDF). American Association of Petroleum Geologists. pp. 573–596. Retrieved 2014-04-25. ^ "Ecuador geology". The Oil & Gas Week. 2013-02-13. Retrieved 2014-04-25. ^ a b c "Chevron ordered to pay $8 billion by Ecuador court". Los Angeles Times. February 14, 2011. ^ a b c d "Ecuador Judge Orders Chevron to Pay $9 Billion". The New York Times. 14 February 2011. ^ a b c d e f g h i Keefe, Patrick Radden (2012). "Reversal of Fortune" (online). The New Yorker (January 9). Retrieved 9 January 2016. Subtitle: A crusading lawyer helped Ecuadorans secure a huge environmental judgment against Chevron. But did he go too far? ^ Krauss, Michael I. (2015). "Chevron v. Donziger: The Epic Battle For The Rule Of Law Hits The Second Circuit" (online). Forbes (April 21). Retrieved 9 January 2016. ^ Smythe, Christie; Hurtado, Patricia (2014). "Chevron Wins U.S. Ruling Calling Ecuador Judgment Fraud" (online). Bloomberg BusinessWeek (March 4). Retrieved 9 January 2016. ^ NICOLE HONG (8 August 2016). "Chevron Wins Ruling Blocking Enforcement of $9.5 Billion Ecuador Judgment". The Wall Street Journal. Retrieved 9 August 2016. Monday's decision affirms a lower-court ruling by U.S. District Judge Lewis Kaplan, who found in 2014 that the $9.5 billion environmental-damage judgment won by New York lawyer Steven Donziger and his Ecuadorean plaintiffs against Chevron was obtained through fraud and corruption. Judge Kaplan ruled Mr. Donziger couldn’t enforce the judgment in the U.S. or profit from the award anywhere in the world. ^ a b Aguinda v. Texaco Inc. , 303 F.3d 470 (2d Cir. 2002). ^ a b "Judge, In Deposition Order, Lambasts Lawyer Suing Chevron". Forbes Blog. 5 November 2010. ^ a b c Feige, David (2008-04-20). "Pursuing the polluters". Los Angeles Times. Retrieved 2009-02-23. ^ "Background on Texaco Petroleum Company's Former Operations in Ecuador". History of Texaco and Chevron in Ecuador. Chevron USA. Archived from the original on 2011-08-16. Retrieved 2011-09-10. ^ a b The March 5, 1987, Ecuador Earthquakes: Mass Wasting and Socioeconomic Effects. Natural Disasters Studies. National Academies Press. 1991. p. 86. ISBN 9780309595131. ^ Alvaro, Mercedes (2014-04-24). "Ecuador's OCP Pipeline to Start Carrying Colombian Crude Oil". The Wall Street Journal. Retrieved 2014-04-25. ^ a b Stephens, Bret (2008-04-19). "Banana Republic and Friends". The Wall Street Journal. Retrieved 2008-10-07. ^ a b c Sanchez, Mariana (2007). "Amazon Tribe Sues Texaco for $6bn" (online). Al Jazeera English (March 27). Retrieved 9 January 2016. Equador's indigenous Cofan tribe is suing the US company for oil clean-up costs. ^ William Langewiesche. "Jungle Law". Vanity Fair. Retrieved 9 January 2016. ^ a b Stephens, Bret (2007). "Amazonian Swindle". The Wall Street Journal (October 30). Retrieved 9 January 2016. ^ "Chevron Estimate for Amazon Damages Rises by $11 Billion". Bloomberg BusinessWeek (November 27). 2008. Archived from the original (online) on 22 January 2009. Retrieved 9 January 2016. ^ "Big Victory for Chevron Over Claims in Ecuador". The New York Times. 5 March 2014. Retrieved 9 January 2016. ^ Brown, Steven E. F. (2007). "Ecuador Cancer Suit Against Chevron Dismissed". San Francisco Business Times (November 19). Retrieved 9 January 2016. ^ "Pablo Fajardo Mendoza & Luis Yanza". Goldman Environmental Foundation. Retrieved 9 January 2016. ^ Chevron Policy, Government; Public Affairs. "Plaintiffs' Expert Reveals Fraud by Lawyers in Ecuador Lawsuit". chevron.com. Retrieved 9 January 2016. ^ Casselman, Ben; Gonzalez, Angel (2010). "Chevron Suit Data Questioned" (online). The Wall Street Journal (April 5). Retrieved 9 January 2016. Subtitle: U.S. Scientist Says He Didn't Write Reports Attributed to Him on Pollution in the Rain Forest. ^ a b c d "The Amazon Post – Chevron's Views and Opinions on the Ecuador Lawsuit" (PDF). The Amazon Post. Retrieved 9 January 2016. ^ "The Amazon Post – Chevron's Views and Opinions on the Ecuador Lawsuit" (PDF). The Amazon Post. Retrieved 9 January 2016. ^ "Comments on the Report of the Court-Appointed Expert Richard Cabrera Vega in the Case of Maria Aguinda y Otros v. Chevron Vorp" (PDF). Amazonwatch.org. Retrieved 2016-01-09. ^ a b Stratus Consulting (3 February 2011). "Statement of Stratus Consulting Regarding Chevron Countersuit". prnewswire.com. Retrieved 9 January 2016. ^ a b c Steve Raabe, "Boulder's Stratus Consulting played key role in Ecuador oil field fight", Denver Post, 26 May 2013. ^ "Stratus Consulting". rssing.com. Retrieved 9 January 2016. ^ "Louis Berger : A Supplemental Report Regarding the Environmental Contamination from Texpet's E&P Activities" (PDF). Chevrontoxico.com. Retrieved 2016-01-09. ^ Joe Carroll; Rebecca Penty; Katia Dmitrieva (29 November 2012). "Chevron's $19 Billion 'Disaster' Gets Hearing". Bloomberg.com. Retrieved 9 January 2016. ^ "Chevron Corporation and Texaco Petroleum Corporation v. The Republic of Ecuador, UNCITRAL, PCA Case No. 2009-23". University of Victoria. ^ a b Reddall, Braden (2013). "Business News: Tribunal Presses Ecuador to Halt Chevron Case Enforcement" (online). Reuters (February 8). Retrieved 9 January 2016. ^ Taos Turner (5 June 2013). "Argentina's Top Court Unfreezes Chevron Assets". WSJ. Retrieved 9 January 2016. ^ ABC News. "International News – World News – ABC News". ABC News. Retrieved 9 January 2016. ^ "Judge dismisses $19B Ecuador judgment against Chevron's Canadian subsidiary". CTVNews. Retrieved 9 January 2016. ^ Yaiguaje v Chevron, 2013 ONCA 758 at para 57. ^ "Chevron Alleges Bribery in Ecuador Suit". washingtonpost.com. Retrieved 9 January 2016. ^ Krauss, Clifford (2009). "Americas: Revelation Undermines Chevron Case in Ecuador" (online). The New York Times (October 29). Retrieved 9 January 2016. ^ "Chevron in Ecuador". chevroninecuador.com. Retrieved 9 January 2016. ^ Mufson, Steven (2014). "Business: Chevron, Patton Boggs Settle Their Epic Legal Battle Over Jungle Oil Pits in Ecuador" (online). The Washington Post (May 7). Retrieved 9 January 2016. ^ "US judge annuls Ecuador oil ruling against Chevron". BBC News. Retrieved 9 January 2016. ^ Smith, Jennifer; Gilbert, Daniel (2014). "Chevron Wins Round On Ecuador Verdict" (online). The Wall Street Journal Europe (March 5). Retrieved 9 January 2016. ^ "Chevron wins U.S. ruling blocking $8.6 billion Ecuador rainforest award". Retrieved 8 August 2016. ^ Romero, Simon; Krauss, Clifford (2014). "Global Business: In Ecuador, Resentment of an Oil Company Oozes" (online). The New York Times (May 14). Retrieved 9 January 2016. ^ a b "Ecuador's PR firm reportedly spent more than $500G on celebrity endorsements". Fox News. Retrieved 9 January 2016. ^ "AMAZON WATCH » Chevron's Threat to Open Society". Amazon Watch. Retrieved 9 January 2016. ^ "AMAZON WATCH » Human Rights Organizations File Amicus Brief Opposing Chevron RICO Decision". Amazon Watch. Retrieved 9 January 2016. ^ "Global anti-Chevron day: Environmental activists stage protests worldwide (PHOTOS, VIDEOS)". RT International. Retrieved 9 January 2016. ^ "True Cost of Chevron". True Cost of Chevron. Retrieved 9 January 2016. ^ Barrett , Paul M. (2014). "Courts: Ecuador Mobilizes Celebrity Friends as Chevron Verdict Nears" (online). Bloomberg BusinessWeek (January 29). Retrieved 9 January 2016. ^ "RFK's daughter backs Ecuadoreans in Chevron suit". Newsday. Associated Press. Retrieved 9 January 2016. ^ "Chevron and Cultural Genocide in Ecuador". The Huffington Post. 4 November 2009. Retrieved 9 January 2016. ^ "Cuomo's ex Kennedy stands to make $40M in secret anti-oil deal – New York Post". New York Post. 15 January 2012. Retrieved 9 January 2016. ^ "Chevron Blames Victims of Its Deliberate Contamination of Ecuadorian Rainforest". The Huffington Post. 17 January 2012. Retrieved 9 January 2016. ^ Barrett , Paul M. (2014). "Energy: Faux Activism: Recruiting Anti-Chevron Protesters for $85 a Head" (online). Bloomberg BusinessWeek (May 30). Retrieved 9 January 2016. ^ Barrett , Paul M. (2014). "Energy: The Real Waste Behind the Phony Anti-Chevron Protesters" (online). Bloomberg BusinessWeek (June 3). Retrieved 9 January 2016. ^ Donny Rico & Chevron make it a crime to defend the environment. 20 January 2014. Retrieved 9 January 2016 – via YouTube. ^ "Ecuador receives support from an international committee due to Chevron's attack". andes.info.ec. Retrieved 9 January 2016. ^ "Nous soutenons la campagne "La main sale de Chevron"". Le Huffington Post. 25 June 2014. Retrieved 9 January 2016. ^ Smythe, Christie (2013). "Ecuador Lawsuit Backer Tells Chevron Judge He Backed Out" (online). Bloomberg BusinessWeek (November 4). Retrieved 9 January 2016. ^ Walker, L. Mark (2013). "Energy Litigation: The Contamination of the World's Largest Pollution Judgment" (online). American Bar Association Section on Litigation (September 9). Retrieved 9 January 2016. For now, it is still the world's largest pollution judgment: the $19 billion Ecuadorian judgment against Chevron for pollution of the Amazon rainforest. But the pollution judgment is unraveling—the victim, it seems, of contamination—contamination by fraud and corruption. The latest shocking revelations may be the judgment's death knell. This page was last edited on 6 April 2019, at 17:58 (UTC).